The Dare Detectives, published by Dark Horse Books, 96 pages, digest-sized, $5.95. “Frantic” is defined, in part, as “done in a hurried and chaotic way.” It is also the first word that comes to my mind when describing the first issue of The Dare-Detectives. Understand, I mean that in the very best way. First of all, “frantic” describes the action, which nearly runs from the first to the last page. It is action that is peppered with good humor throughout. It is almost as if the 100-mile-an-hour doings are more of a set-up for the ha-ha’s than action for action’s sake. And I did, by the way. “Ha-ha” that is. The humor is something like a cross between Looney Tunes and the late-80's era Justice League by Keith Giffen and J.M. DeMatteis. With a funny talking rabbit. I bet some of you will “ha-ha” as well. The subdued sequences come at the right times and serve their purpose of setting up more conflict and action. The characters themselves show hints of interesting characterization. Though, as of the first issue, they do take a back seat to the star of the show, The Action. All of this is to say that creator/writer Ben Caldwell did a good job writing his baby. His timing, sense of drama and humor (Have I mentioned humor...?) are to be admired. Before Detectives, I couldn’t tell you the last time a comic book made me laugh. “Frantic” also describes Caldwell’s art style. It reminds me of the work of Tex Avery and Kyle Baker, but still has it’s own flair and sense of Saturday morning “cartoony” fun. It is so charged with kinetic energy, I can imagine the artist scribbling away at his drawing table, while flailing about wildly, acting the scenes out as he puts a story together, ala Stan Lee. 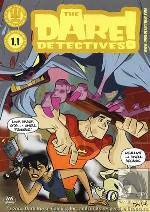 I discovered Dare Detectives late, as it was published in 2004. Better late than never. MUCH better. Highly recommended for teens and up.